The images of the honey and the barbecue sauces are inviting. The bowl of Chips look well seasoned, light and bright. The burgundy colored strip across the middle is a variation on the regular Chips packaging theme. The writing is a little cartoon-like that doesn't really fit into the range, but that is a minor gripe. The brownish colored bag has background images of Ridged Chips, which again separates them from the regular range, but also means there is more going on than necessary. These were thick and firm and the Ridges only helped the crunch. A mouthful of these and you feel like you are biting into food with a loud snap and crack rather than a crispy snack food. 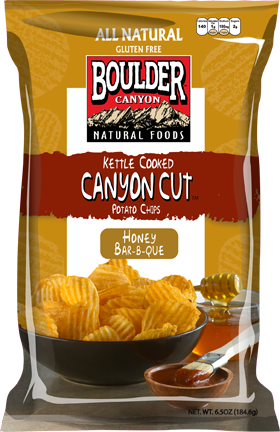 The Ridged nature of the 'Canyon Cut' Chips make the Chips feel firmer to the touch and less oily bubbled than the standard Chips. There is some clear seasoning on all the Chips - it is a combo of caramel, paprika and tomato powder. This remains on the fingers, but in less quantity than on more oily Chips. When the bag was opened and the Nose Plunge Test activated, a mild but sticky barbecue smell erupted. The taste was similar. It was a good, [un]healthy, sticky sweet flavor that merged sweetness (not necessarily honey) with barbecue flavoring pretty well. There was little to no heat, but the after-taste was comfortable and warm.